Dome@NSCI, India’s premier entertainment and leisure destination, hosted the ‘Lokmat Maharashtrian of the Year’ award yesterday, February 20, 2019. The awards honour individuals who have dared to dream, not only for themselves but also the society and humankind. It is aimed at recognising their selfless and untiring work across categories, and whose efforts have altered the landscape of Maharashtra from every perspective. 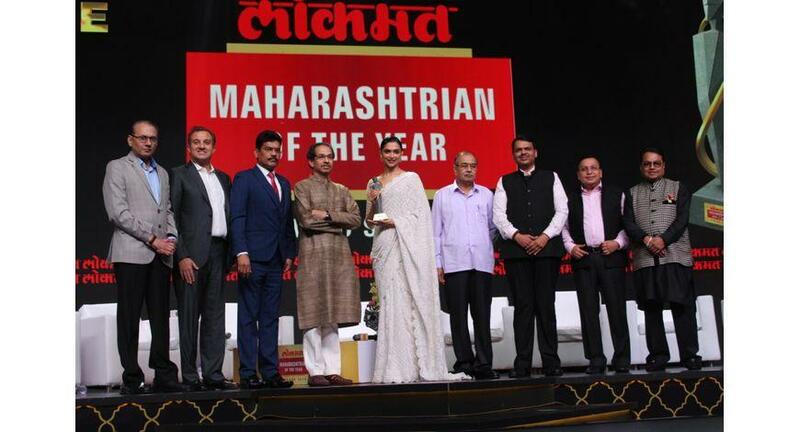 Lokmat Maharashtrian of the year is the largest non-entertainment awards and one of the marquee initiatives of Lokmat Media which honors exemplary work from across fields like Politics, Administration, Social, Arts, Science, Sports, Entertainment, etc. Some of the most renowned personalities were present at the event likehonorable CM, Shri Devendra Fadnavis along with his wife Amruta Fadnavis, Uddhav Thackeray with wife Rashmi Thackeray, Praful Patel, Sunil Shinde, Zarine Khan and Isha Koppikar among others. This unique event brought the powerful and charismatic Chief of Shiv Sena –Shri Uddhav Thackeray who was awarded as Power Icon and Shri Devendra Fadnavis together on one stage talking about the alliances between the two parties in the next election. The event saw a fireside chat with the current audience favourites Deepika Padukone who was awarded as Iconic Performer and Vicky Kaushal who was awarded as path breaking performer, as well as a discussion between honourable Chief Minister, Shri Devendra Fadnavisand, Riteish Vilasrao Deshmukh on topics from politics to Chief Minister as a husband. The event also witnessed the immensely followed by public figure ‘Dr Dattatraya (AppaSaheb) Narayan Dharmadhikari’ who was recognised for his tremendous social work in Maharashtra state. While announcing this Award, Vijay Darda, Chairman of Lokmat Media Limited and Ex-Member of Parliament, said, “We are proud to honour Maharashtra's sparkling personalities who have contributed to the State's progress through their work and relentless efforts in their respective fields. These icons are the faces of growing and prospering Maharashtra and their work have impacted positively the society at large. These Awards are not only bringing Maharashtra's best abilities on the world map; but also inspiring many others to contribute significantly to the State's progress and the public life".